Are social impact bonds actually useful? Social impact bonds have become an increasingly discussed topic in Malaysia. But what exactly are they and when does using them make sense? Are there better approaches to getting value out of social sector programmes? This paper compares social impact bonds and evidence-based impact investments as strategies for increasing government returns for investments in social programmes. A social impact bond involves three players: an NGO or social service provider, a government agency, and an investor. The idea behind a social impact bond is that the government does not pay upfront for running a social programme. Instead the NGO, or “bond provider” runs a programme with its own financing and gets paid afterwards by the government agency based on the outcomes. If the programme performed well according to the impact measures, the payout might be good. If the programme didn’t perform, the NGO might not get paid it all. For example, the government might say that it will pay a certain amount to have the rate of recidivism of ex-convicts reduced by 10% over the next five years in some community. The NGO runs programs to help reduce that over five years and, if it is successful, collects the payment at the end from the government agency. Since running a social programme is often quite expensive, the NGO seeks out an investor to finance its operations upfront. When the government payout is made the NGO and the investor share in the profits or losses. The benefits of social impact bonds seem to be clear. The government only pays if there is a good outcome from an intervention, the investor can make a profit, and the NGO can pursue an innovative approach to solving a social problem because the focus is on the outcome. Social impact bonds hold a lot of potential because they change the way governments pay for services — based on performance — and allow organisations pursuing new approaches to solving social problems to try their hand out. In practice, things are much more difficult. Although the social impact bond concept has been around for nearly 20 years, only a handful of them have been carried out around the world because they are so difficult to implement. Practical and structural issues with social impact bonds make them complex to execute and their benefits difficult to attain. The finances for a social impact bond only make sense in situations where very deep cost cuts can be made in a programme without affecting the social outcomes. Impact bonds also do not address the core issues that are holding back innovation around the delivery of government services. While social impact bonds can be useful, we find the government should focus on adopting a policy of evidence-based impact investments. This strategy makes use of pilot programmes to create real data about which approaches are most effective and scales those up with pay-for-performance incentives. It makes more sense for government to reduce the risks of a social intervention upfront rather than to pay a significant premium to an investor for having taken it on after the fact. It also leads to better social outcomes; a failed social impact bond can leave beneficiaries hanging for years until the bond matures. Evidence-based impact investment yields greater benefits, is less complex to implement, and can be applied to create innovation and cost savings to a much larger portion of government budgets. The first challenge is identifying appropriate investors. Investing in a social impact bond is a far more complex decision than investing in a traditional bond. While traditional bonds are often issued in stable and predictable industries like property, social impact bonds typically fund new and innovative approaches to solving social issues. As an investor, you need to judge not only whether the investment makes financial sense, you have to judge whether the social organisation has the capability to execute the programme at scale (operational risk) and — a much more difficult question — whether the programme will have the desired social impact (social risk). Essentially, you’re looking into the future and asking whether an organisation has the ability to solve a complex, human problem and putting your money on it. Investors who have this kind of expertise and are comfortable with making these kinds of decisions are far and few between, particularly in Malaysia. In theory, this should allow more NGOs to pursue innovative approaches to getting the same results. The trouble is that impact bond investors would become the limiting factor to innovation. Malaysia’s social sector funders — particularly foundations and CSR organisations — shy away from innovative initiatives and overwhelmingly invest in orphanages and traditional education NGOs. These investors would privilege tried and tested approaches to solving social challenges, stripping away one of the key benefits of social impact bonds. The fact that financial returns are contingent on social impact would seem to have the effect of making them even more averse to experimentation. This is important because, in a little bit, I’ll talk about why it’s so crucial for social impact bonds to support innovative rather than traditional approaches for these bonds to make sense. A social impact bond that works doesn’t just have to have social impact — it also has to create financial returns for the parties involved. The trouble is that in order for this to happen, using a social impact bond has to yield significant cost savings over the current way of doing things. This might happen if, for example, an NGO is far more efficient at delivering a programme than the government is. That means than the NGO has to deliver the social outcome at less than half the cost the government could do it in order for that bond to make sense. Even if the government is inefficient, social impact bonds would make sense only for short interventions or cases of extreme inefficiency. Social impact bonds may work in select cases but they probably aren’t going to be able to deliver improvements at scale across the government. An additional challenge is that delivering cost savings at scale is difficult for NGOs. On a small scale, it’s probably fairly easy for an NGO to be more efficient than government. However, governments don’t use social impact bonds to solve small scale issues. They’re looking at reducing the rate of recidivism amongst 3,000 prisoners or improving health practices in 5,000 families. As NGOs scale up to address these challenges, their cost-effectiveness falls. In fact, an NGO forced to solve a big enough problem can end up just as cost ineffective as a government agency. In Malaysia, we often see diseconomies of scale in the social sector because it’s so hard to hire the right kinds of people. The more an organisation is forced to expand, the more it has to hire low-quality staff (as it puts pressure on the social sector job market) or the more its payroll spikes upwards (as it has to hire from the private sector), and the less cost-effective it becomes. When it comes to reducing financial risk and enabling the development of innovative solutions, it turns out the government and taxpayers foot the bill for both successful and unsuccessful projects on the aggregate — and then some more. The price of avoiding an investment in a failed 5-year programme is paying twice as much for a successful one. Investors then need to make a bit more off the top so that it’s worth their time. This happens because the government is the sole underwriter for social impact bonds. If the market is going to work for investors, any loss an investor makes on a social impact bond has to be compensated by a gain somewhere else in their portfolio of impact bonds — and so necessarily by the government. If impact bonds are risky, investors will demand higher rates of return from government to compensate for potential losses. Otherwise, two things happen: (i) private investors effectively subsidise government services when they lose money and (ii) they exit that market because they’re not making money in it. Since the government assumes all of the risk of failed and successful projects, this isn’t much different from the status quo. It might be argued that a social impact bond provides incentives to the investor and possibly the NGO to cut costs where a grant might not. However, all the same kinds of incentive schemes that might be present in a social impact bond can be present by directly contracting an NGO for a service. The NGO has an incentive to reduce costs so long as it can retain all or a portion of the profits from doing so and it has an incentive to increase performance if there are rewards for doing so. The real challenge of implementing incentives for cost saving or performance is that government agencies dislike uncertainty in their budgets. Underspending relative to budget is penalised because it results in a shrunken budget in the following budget cycle. That means that there is a disincentive for government agencies to find cost savings. In order to pay for impact or share cost savings with a social service provider, an agency would have to allocate a portion of their budget for incentives. If the agency doesn’t pay out all the incentives, the agency risks getting penalised. It’s much easier for the agency not to include incentives for cost savings or performance. Interestingly, social impact bonds introduce even more uncertainty in the budgeting process because they create future budget obligations that could either be very small or very large depending on the social outcomes of the initiative. While government agencies may be happy to participate in social impact bond pilots that are funded outside their budgets, they may not be so enthusiastic when the real work of deploying social impact bonds results in their programme budgets being cut. In the end, there are few things that social impact bonds achieve that government couldn’t achieve on its own, more cost effectively, and in a less complex way. Evidence-based impact investment is a set of policies that enables smart procurement by government agencies. This approach employs direct procurement from NGOs as well as pay for performance. In a first step, the agency invests in a series of pilots for innovative approaches to addressing a social challenge. The impacts and cost savings of the pilots are measured. In a second step, the agency commissions the highest performing pilots for deployment at scale. In a third step, performance and cost savings are incentivised by handing down bonus payments to organisations that attain particular impact and cost-savings thresholds. Agencies are incentivised to employ evidence-based impact investments because cost savings are also shared with the agency. When an agency reduces its budget expenditure, part of the savings are transferred into a budget allocation the agency can use to pursue new social programmes. It’s probably fairly clear by now that social impact bonds are expensive to implement. On a successful 5-year bond, government (and also taxpayers) may end up seeing only half of their money going to create social impact and the other half going into an investor’s pocket to cover risk. While this is better than the current approach government uses to procure services, it is still far from being an efficient way to spend taxpayer money. When it comes to proven approaches to addressing a social problem, it makes more sense for the government to procure directly from the NGO. Having an investor front the money for a social programme is very costly for the government and that expense doesn’t make sense when the outcomes of the programme can be gauged from past experience. For small but risky projects, the transaction cost of arranging a social impact bond is too high to make it feasible. That means that social impact bonds are most appropriate for large and risky projects. But does it make sense to gamble on large-scale social programmes? It seems more prudent to run pilots and measure outcomes closely rather than pay for large-scale gambles. If a large-scale project isn’t a gamble, then it makes more sense to procure directly. Investing in pilots enables enables a wider variety of innovative approaches simply because pilots are cheaper to finance and have quicker feedback loops than social impact bonds. One indicator that social impact bonds may not be actually meaningfully supporting innovation is that there have been so few of them — which means that they are not actually enabling many alternative approaches. One might argue that pilots can and should be deployed before an organisation raises money for a social impact bond. While this is undoubtedly true, it’s not clear that it makes sense to use a social impact bond once the social impact of the approach has been established. Investing in pilots and then procuring directly — using the approaches mentioned earlier — is also an advantage to NGOs. Under this approach, NGOs can focus on innovating and creating social impact rather than convincing skeptical investors to finance a risky government programme. Measured impact and cost savings: Government agencies may be spending money ineffectively because they have a poor idea of the social impact created by their investments. Since the payout for impact bonds is based on impact, we know exactly how effective each investment is, enabling more intelligent expenditure. A policy of using pilots to decide which approaches should be used to solve social problems at scale would have more far-reaching effects than social impact bonds because it could be applied to a much larger part of the budget, including many areas where impact bonds would not be feasible. Direct procurement is also more efficient than investing in social impact bonds because (i) the government saves on the cost of paying investors for the risk they have taken on and (ii) the government pays for both successful and failed social projects on the aggregate with social impact bonds. Reduced financial risk: In a classic government procurement of social services, the agency pays for the service whether or not it successfully delivers social outcomes. In the case of a social impact bond, the agency only pays for successful outcomes, which can make it more comfortable with allowing the pursuit of innovative solutions. While impact bonds involve a slightly lower financial risk, they lead to a much higher risk to society if the intervention fails. Under evidence-based impact investments, the government reduces risk from the start by conducting pilots and using the outcomes as a basis for running larger scale programmes, reducing both financial and social risk. Enabling innovation: Government procurement of social services is skewed towards officers’ ideas of what is likely to work and what isn’t. This means that innovative approaches to solving problems face an uphill battle in the procurement process and officers take big risks when working with new approaches. Shifting the focus to outcomes and paying only for good outcomes means that the financial risk of failure is borne by the NGO. This gives the organisation more flexibility to pursue new methods of achieving the end goal. Investing in pilots to test out innovative approaches to social problems leads to far more innovation because more approaches can be tried out at a small scale and there is a quicker feedback loop. It makes more sense for the government to pay for pilots to reduce risk before implementing a social programme than to pay investors for having taken on risk after the fact. 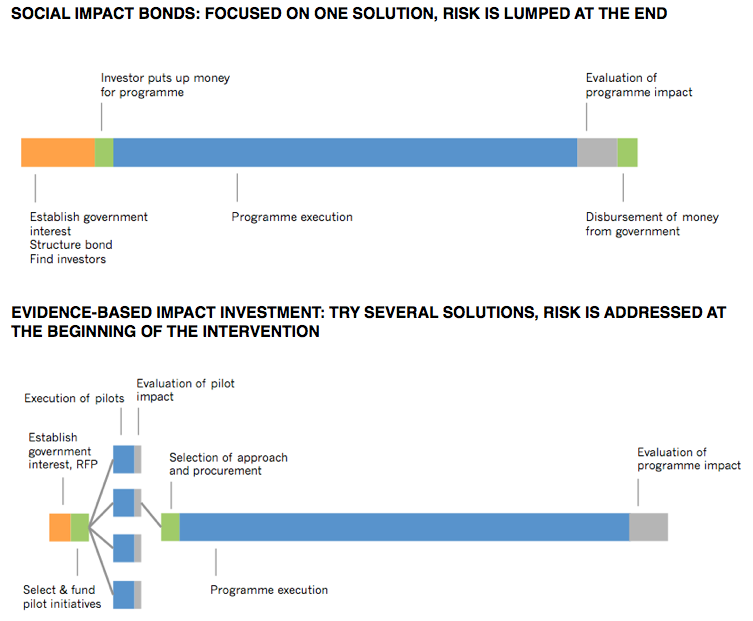 Incentives: For the provider and investor of a social impact bond, there are strong financial incentives to make the programme as cost-effective as possible because it directly influences their rate of return on the bond. By contrast, there is little incentive (and sometimes a disincentive) for an NGO and a government to cut costs because budgets are set and it may be required to return unspent money. Evidence-based impact investments employ incentives to reduce government expenditure at both the NGO and agency level. This has several advantages. First, unlike social impact bonds, government agencies have an incentive to participate beyond the pilots. Second, it prevents situations where social impact bonds are structured in a way such that only the investor captures the cost savings. When do social impact bonds make sense? There are cases where social impact bonds achieve things that government could not achieve on its own. Social impact bonds make sense when facing a particular kind of operational risk: scaling risk. While a pilot is good to demonstrate social outcomes on a small scale, there will be situations where there is a great deal of uncertainty about whether a social outcome can be accomplished at scale. Scaling risk is especially present in industries where scaling up can be hard, like education. If there are specific concerns about the scalability of an initiative, the only way to find out is to scale it up. If the government doesn’t want to bear the risk of scaling it up — at least in the short run — a social impact bond makes good sense. Overall, however, many of the benefits social impact bonds promise are not as strong as they might seem. In Malaysia, many social sector funders pursue very conservative funding strategies. Overall, we find that social impact bonds are a tool to achieve something which the government could achieve in other ways with greater social impact and at lower cost. If we can get the government to adopt social impact bonds, chances are we can get the government to adopt evidence-based impact investments as well — to greater benefit.